Last weekend I attended our Stampin’ Up!® Local OnStage event in Melbourne and the team I am part of decided to do a team swap. I decided to create a card using my current favourite set, Tropical Chic, and the co-ordinating products. Here is the first sample I made. I liked it but thought it needed a little more. This is my second sample and what ended up being my team swap card. I think the extra strip of paper worked well. I really like these colours together which are taken from the Tropical Escape DSP. I also love the extra touch the Metallic Sequin Assortment gives. These have a pink tinge to them which fit perfectly with my colour combination. If you’d like to recreate these cards you can purchase all or any of the items by clicking the links below which will take you directly to my Online Shop, or alternatively email me or call 0418 218 467 and I’ll place the order for you. When I made this card for my April Stamp-A-Stack class I really liked it so thought I’d adapt it slightly and use a different colour combination (we didn’t know about the Colour Renovation back then) for my Convention swaps. I decided not to put pressure on myself this year either and limited myself to 50 swaps only. I had them done by early April which was great. One less thing I had to worry about. Normally I’m finishing them off the night before. The colour combination I used in this card was Rich Razzleberry, Pale Plum and Mellow Moss. As in the past I thought we’d only have Rich Razzleberry until the next new IB&C was released in September, so I decided to change that colour to Elegant Eggplant instead. Unfortunately even though Elegant Eggplant is staying, Pale Plum and Mellow Moss will be leaving us. This is the finished swap card. Apart from the colour change I also layered a smaller flower on top of the larger one from Vintage Vogue and used a smaller Clear Rhinestone Brad. I really liked this colour combination too. I have a feeling Pale Plum and Mellow Moss will be 2 colours I won’t part with once the Colour Renovation takes place on 1st September. I’m sure we’ll all have a colour or 2 we wish wasn’t leaving us. Make sure you stock up if that’s the case and sooner rather than later so you hopefully don’t miss out. 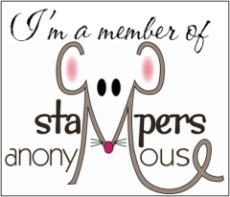 All content on this site is the sole responsibility of Nicole Stalker as an Independent Stampin' Up! Demonstrator. The use of and contents of the classes, services and products offered on this site is not endorsed by Stampin' Up! All Images © 1990 - 2018 Stampin' Up!